Despite its strong resemblance to heather, this unusual evergreen shrub is actually in the Solanaceae – the same family as the tomato and potato! It naturally grows on upland slopes of Chile and Argentina, and like a heather its tiny over-lapping leaves are an adaptation to the dry soils – an example of convergent evolution! 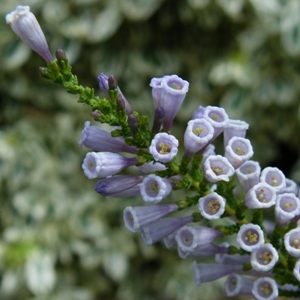 Commonly known as the violet pichi, the abundance of tubular lilac flowers provide a stunning display, and would look superb in a sunny spot, with a little protection from cold drying winds.